South Africa’s new vehicle industry grew 2.1% in March, with total sales of 48 534 vehicles according to the latest data from the National Association of Automobile Manufacturers of South Africa. This follows a minor decline of 0.1% in February and growth of 3.7% in January. Year-to-date, new vehicle sales are up 1.9%. In an about-turn for the industry, this growth was driven by sales through the dealer channel – where consumers are active. Conversely, government and rental channel sales saw sharp declines of 22.8% and 22.5%, respectively. 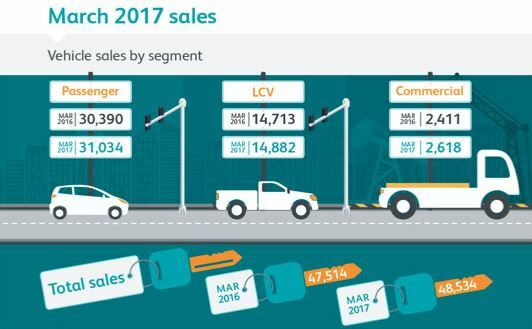 Passenger car sales through the dealer channel grew an impressive 14.3%, year-on-year, with light commercial vehicle (LCV) sales seeing marginal growth of 0.8% off an already strong base. 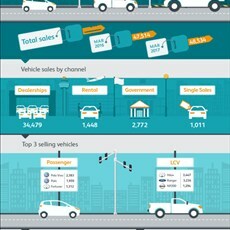 This sales performance and consumer confidence is reflected in the demand for vehicle finance. WesBank’s internal data shows growth of 8% for new vehicle finance, compared to March last year. This past month also saw the average new vehicle price reach an all-time high, representing an 8% increase year-on-year. The strong demand for new vehicles was not at the expense of used vehicle sales, where application volumes were 13.4% higher than the same time last year. Consumers shopping in the used market during March were also spending 8.6% more on average, than last year.